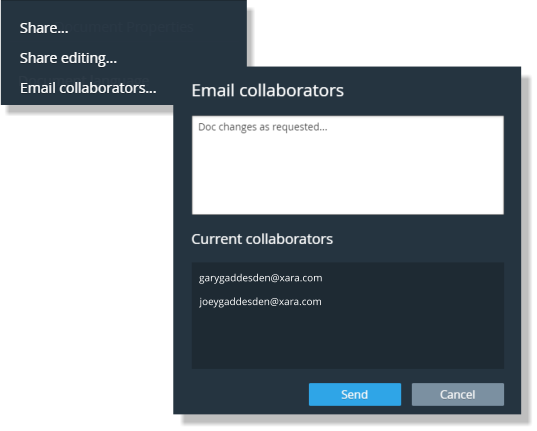 Premium users can collaborate with other premium users by sharing a document with editing. You'll need to have saved the document first - if you haven't then you'll receive a prompt asking you to do so. Choose Share Editing… and then enter the email of the recipient you want to share editing the document with. You can add a message too, if you want. You can enter multiple email addresses, comma separated, and each will receive an email inviting them to share editing of your document. When the recipient receives an invite to share, they follow a link in the email, and are taken directly to the document where they can start editing. Users who already have access to the cloud drive folder in which the document resides already have share edit rights. And when they open a document they are also added to the collaborator's email list, so you can see at a glance everyone who's a collaborator and you don't have the tiresome business of having to add email addresses manually to the share list. When your recipient joins the editing session, the status line shows a colored label with the initial of the users editing this document. So, in the following case, there are three people editing the document. You can tap the colored label to see the email address of each user. You see changes they make, as they make them. It’s important to understand they are not editing a copy of the document - they are editing the exact same document you are. If they click Save, it will save back to your cloud drive (because it’s your document you are letting them edit). Keep in mind that if you Undo while there are multiple people working on the same document then this will just work for your individual edit changes, and you can Undo only until you hit someone else's edit. Otherwise - undoing another users' work could lead to major confusion. Imagine that you are writing some text and your colleague tries to undo his own image edit, which consequently removes parts of your text! An additional benefit of working in cloud based application is that Dropbox and Google Drive maintain older versions of your files which provides an easy way of viewing and reverting back to earlier versions, so it’s a safe, easy and storage-saving way of maintaining multiple versions of your documents. So if somehow you or one of your colleagues manage to accidentally delete someone else's crucial work - you can always get back to previous version of your files.